There are some things we just don’t think to thank our spouses for – but maybe we should. For instance, you know how in the movies people wake up morning-fresh with tousled hair? Well, in real life, it’s morning breath and bed-head. Yet our spouses love us through it and in spite of it. And have we ever said “thank you”? Here’s five more you may not have said “thank” you’ for. 1. That warm spot they create in bed that you roll into the moment they shift. 2. Waiting until the commercial break (or fast-forward break) in your show to tell you something. 4. Helping to develop the secret code you share. The look, gesture, raised eyebrow, or cue that says wordlessly Let’s blow this joint or Did you hear what I heard? or Did you see the chick in the pink tutu with the leopard boots?! 5. Saying “I DO” and meaning it. And it makes it sooooo easy to reciprocate! Thanks, Pauline! #3 and #4 apply to other relationships, too. M and I certainly have the raised eyebrow connection down! ALL of them, except #2. When Jim has something he just has to share, he picks up the remote and puts the program on “hold” so he can tell me. This happens more as we’re getting older, as we both understand that otherwise we might forget what we wanted to say. 😉 And that’s a sweet thing, too. Had to laugh at that one, Marylin – “pause” is one of the best inventions for over-50s that has come down the pike! 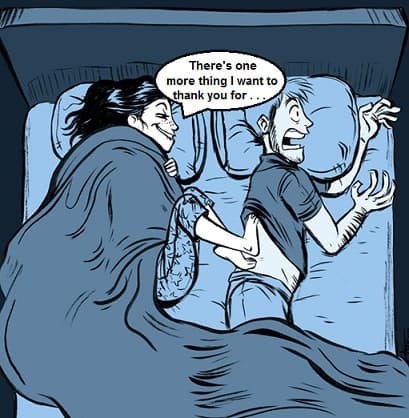 I enjoy reading about the bonuses of being a couple, I used to put my cold feet on his warm feet, since he used to like this ‘game’ of getting warmer and cozier in bed. I have been divorced for 8 years but will always smile when I am at an airport or park, where someone is meeting their special other and their faces all lit up when they spy each other. Reminds me of that “South Pacific” song about seeing each other across a crowded room. So sweet! Isn’t the airport the best place ever to people watch, Robin?! From spouses to grandparents spotting grandkids, I love watching the anxious search bloom into a face full of smiles! The secret code is the best. That is fun, isn’t it, Lisa?! I can’t tell you how many conversations my husband and I have had that sound something like: Me: “That reminded me of . . ” Him: “Me, too!” Enough said! Maybe that’s more mutual mind-reading after more than 3 decades, but it still feels like part of a secret language!